The Dishtowel Potholder Tutorial will lead you through all the necessary steps to making this thrifty and useful craft. The end result is a decorative potholder for your kitchen. For a kitchen towel craft, this project is great. You can customize them to any season or any kitchen depending on your choice of fabric and applique. The apple applique on this example is a perfect fruit for most kitchen decor. Make a small project that's fast and practical when you follow this tutorial. For more patterns like this one, check out: 24 Patterns to Make Dish Towels! How elegantly simple. A potholder from a dollar store dishtowel is both economical and uniquely crafty. 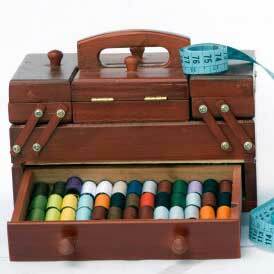 This would make for a great beginner sewing project. I imagine the dishtowel made into a potholder would wash and dry well. Make two to tie together with a coordinating ribbon for a great hostess gift idea too. I've been looking at my ratty potholders and thinking its about time to buy some new ones. This is the simplest potholder pattern I've ever seen. Instead of adding a layer of batting between two layers of fabric, the neat folding of a kitchen towel creates a nice thick potholder without having to add that pesky binding. Thanks for the great idea I am off to the dollar store to find some tea towels. Why can't I open the patterns or the tutorials? I'd like to see how the patterns look. Hi bhowk 3977402, If you click on the "Click here for Sewing Pattern" link above you will find the full tutorial. Hope that helps! WOW, I love it, thank you.